Published on July 20, 2018 in Resort Renovations. Closed Tags: Family Resort, New Hampshire Resort, renovations. 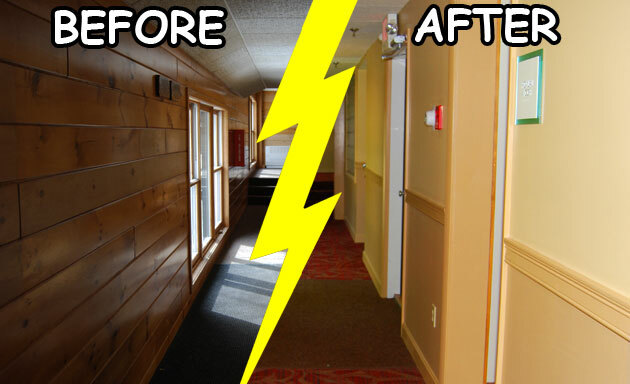 If you have been by the resort lately you may have noticed a few changes with our front desk check-in office. 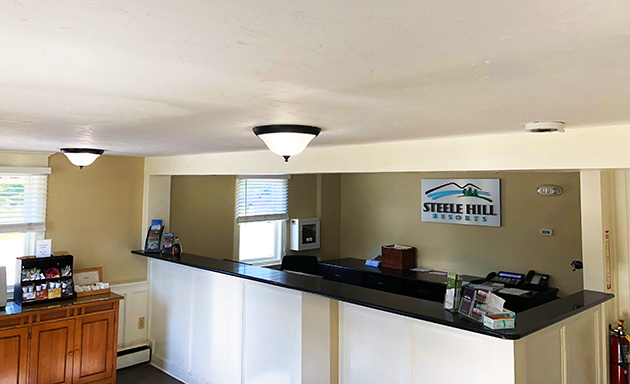 We have recently completed a full renovation to ensure guest registrations go as smoothly as possible so you can get out and enjoy your vacation here at Steele Hill Resorts. As you step in you will notice that the old flooring is gone and has been replaced. The center column at the desk has been removed to create more open visual space for check-ins. New granite counter tops were installed along with new cabinets. A PTAC Air Conditioner was added to keep the office cool for guests during those hot summer months, and nice and warm during the winter season. 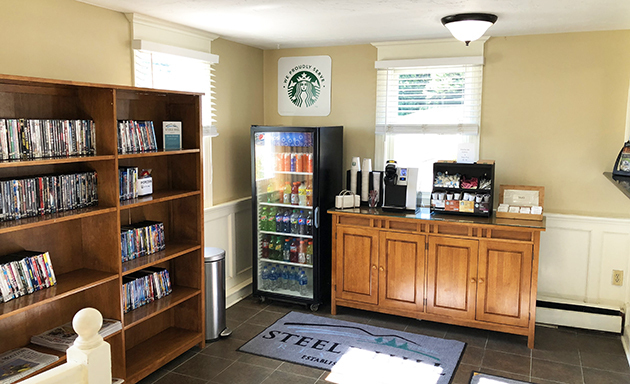 Guests looking to rent a movie can still head to the front office to browse our large selection and pick a movie or two to watch with the whole family. The front office is a great place to visit if you’re looking for fish nets to catch frogs in our pond or to grab a pair of clubs and a score card to play a round of golf on our 9-hole golf course. During the winter months swing by the front desk and rent yourself a pair of snowshoes to explore the trails surrounding the property. If you’re looking for suggestions on things to do and see in the area our concierge and front desk staff are always happy to help. Let us know what you think of the changes, and we look forward to seeing you at check in! Published on December 19, 2014 in New Hampshire Resort and Resort Renovations. Closed Tags: New Hampshire Resort, NH Resort, resort renovations. 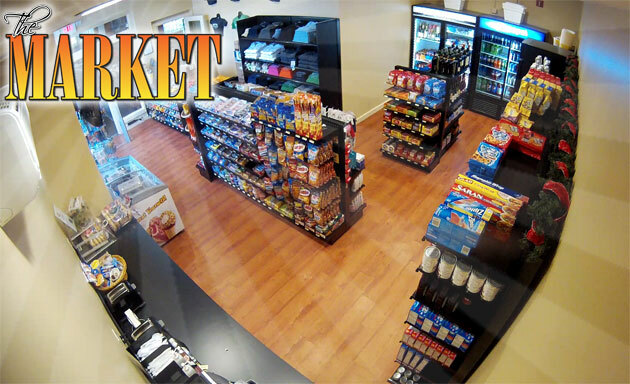 Guests are in for a pleasant surprise with the roll out of our onsite convenience store. Located in the West Amenities building near the large indoor pool, The Market covers all your convenience needs. From a fresh cup of Starbucks Coffee to an assortment of tasty food items, the new store is a veritable one-stop-shop to restock your in-room kitchen during your next visit. Specialty items include a variety of beer and wine and a wide range of exciting Steele Hill merchandise. Enjoy your stay lounging by the pool without being inconvenienced with a trip to the grocery store. Stop by the Market at Steele Hill Resorts during your next visit. Published on June 13, 2014 in New Hampshire Resort and Resort Renovations. Closed Tags: New Hampshire Resort, NH Resort, resort renovations. With much anticipation, we are proud to announce the arrival of the Signature Series rooms at Steele Hill West. After an extremely busy winter and spring, the new units are ready for the spotlight. This year marked a complete gutting and overhaul of the developer owned West Townhouse Units. 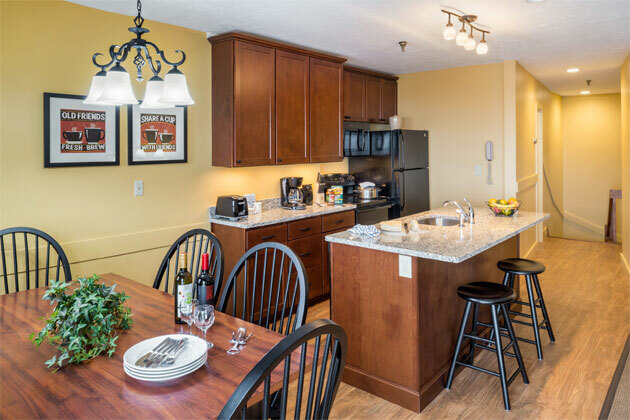 Located near the main amenities center, this block of rooms sets a new standard for accommodations in the Lakes Region. Experience magnificent, open-concept kitchens with granite countertops, new cabinets and fresh appliances. Imagine enjoying a cup of coffee by the breakfast bar, while your family curls up by the fire on all new furniture or enjoys a movie on the mounted flat-screen television. Additional details include hardwood style laminate flooring throughout the kitchen, granite counters in all the bathrooms, and mounted flat-screen TVs in both the master bedroom and the guest bedroom. With bedding variations that include a sleep 6 with a king bed in the guest bedroom and a sleep 8 with two double beds in the guest bedroom, these townhouses offer accommodations for all group sizes. Experience Steele Hill’s incredible views of the Lakes and Mountain from the deck of our new signature townhouses or relax in the spacious living space with all the amenities of home. The signature rooms offer a new face to Steele Hill’s long tradition of hospitality. Published on July 24, 2013 in New Hampshire Resort and Resort Renovations. Closed Tags: New Hampshire Resort, renovations, resort renovations. Steele Hill Resort aims to consistently improve the guest experience year after year. In the beginning of 2013 the expansive West Hallway was targeted for a complete remodel. As a major element of our guests’ first impressions of Steele Hill West, this hall provides direct access for 40 West Townhouse units to the large, indoor amenities center. With the goal of modernizing over 300 feet of hallway and laundry facilities, this renovation project was a significant undertaking. The project called for replacing the more dated, pine board walls with fresh drywall, new rub rails and complete baseboard coverage. New carpets including runners near the freshly installed glass entry doors capped off the project. With insight from our design team and a view towards modernization, a coordination of new paint and carpet colors helped breath fresh life into the hall’s appearance. Now that the project is fully completed, this new face to the West Hallway really does wonders to raise the standard of first impressions at the resort. As a small part of our commitment to consistent improvements, the hallway project is just one brick in our road to a renovation renaissance of the entire resort. Published on April 17, 2013 in New Hampshire Resort and Resort Renovations. Closed Tags: indoor pool, New Hampshire Resort, renovations. The indoor, heated pool located at the original resort facilities has been a staple of Steele Hill since the pool area was first built in 1976. Many of our original guests have fond memories of teaching their children to swim in the resort pool or relaxing with a book while appreciating the views of the lakes and mountains. Now some of those children have grown up to bring their kids back up the Hill to enjoy the pool they had so much fun in when they were little. This resort amenity has been at the heart of the property since the original expansion. Given the importance of the resort pool to Steele Hill’s identity, management has made a significant effort to renovate the area while maintaining the relaxing atmosphere it is known for. In an effort to brighten up the facility and reface the area, our maintenance staff went to work stripping the entire floor from the pool space. With help from our vendor at Sierra Stone, we brought in a team to completely re-floor the facility with a bright, safe, stone flooring system that helped turn back the clock on this great amenity. Given the recent renovation of the adjacent patio that houses the resort’s outdoor pool and sun-bathing areas, the new floor for the indoor pool is another key project to ensure that Steele Hill Resorts is one of the most modernized, amenity-rich destinations available to people visiting the lakes region. Published on July 26, 2012 in New Hampshire Resort and Resort Renovations. 0 Comments Tags: fitness center, gym, New Hampshire Resort, resort renovations. Are you as serious about your health as you are about your vacation time? If the answer is yes then Steele Hill is the resort for you. Forget our network of hiking trails. Forget the pools, tennis, basketball, racquetball and golf. Our shiny new fitness center is the perfect place for you to get serious about your daily workout routine. From elliptical machines to treadmills to recumbent bikes, the new aerobic section includes a variety of high quality fitness equipment. Each cardio station sports its own flat-screen TV for your workout entertainment. If you are not in the mood for a run, the weights section has everything you need to break a sweat. From our CYBEX tower station to our two flat benches and high quality dumbbells, the new gym is designed for a full body workout. Additional amenities include Medicine balls, stretch bands and a plyometric pull-up/dip station. The new fitness facility has been relocated to a completely renovated space near the main indoor pool area at Steele Hill West. After a hard workout it is just a short walk through the locker room to relax in the pool or kick back in the roman spa. The new fitness center offers a professional gym experience down to the last details of rubberized flooring, full air conditioning and a stainless steel water cooler. So if you are looking for a fit-cation, come visit our New Hampshire Resort and check out the new fitness center. Published on February 27, 2012 in Resort Renovations. 0 Comments Tags: accommodations, New Hampshire Resort, renovations. Looking for the comforts of home while on vacation? Steele Hill’s freshly renovated 2 Bedroom East Units are your perfect choice. These spacious accommodation have been fully overhauled during the months of January and February. 2 bedroom East suites now include beautiful granite counter tops in the large kitchen area, granite counters in the master bathroom and granite counters in the living area bathroom. Even the kids get to vacation in luxury with granite counter tops in the guest bathroom. That is a lot of granite! Renovations include a complete design update with new paint, new window treatments, some new furniture and updated artwork to brighten up the space. Speaking of bright, we have also added modern light fixtures to show off the rooms. Renovations include the addition of 3 new flat-screen TVs to each unit. After a long day of exploring the Lakes Region, sit back and relax in-front of the 42 inch TV in the living area or catch the news from your Jacuzzi tub while watching the wall mounted 37 inch TV in the Master Bedroom. Even the guest room has a flat-screen. From all the new room features to the spectacular views from the decks and patios, the 2 Bedroom East units are now some of the premier rooms at the resort. We can’t wait to see how much guests enjoy their stays in these new units. Up at Steele Hill we take pride in our resort amenities. Among our most spectacular amenities, the west indoor pool is a major attraction at the resort. With close to 45,000 gallons of water enclosed under a giant glass atrium, this pool area is unique to the Lakes Region. Anybody who has had the chance to bask in the roman spa or take a ride down the large slide into the main pool will probably agree. Given the number of guests that enjoy this facility each year, we make it a point to keep the facility in ship shape condition. During our slowest week, we take the pool area offline for updates and renovations. This year proved to be no exception. From November 28th through December 9th our maintenance staff went to work with a long list of updates and renovations to the west pool area. This year’s task ranged from aesthetic improvements to conservation renovations. 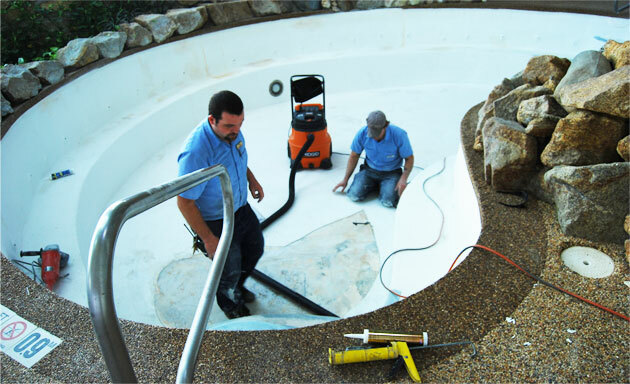 Our maintenance staff worked extended hours painting the inside of the atrium and resealing the roman spa with fiberglass. 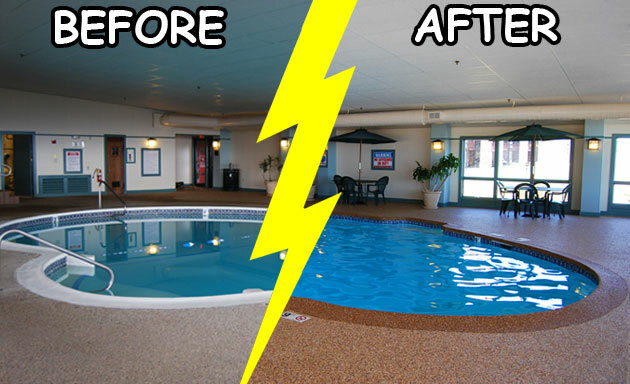 The down period also included deep pressure washing of the new pool floor and top to bottom cleaning of the three story glass windows between the pool area and the lobby. Renovations included piping repairs and adding a new brominator to the small hot tub. Beyond the standard repair work, we also replaced 40 panes of glass in the atrium structure. This improvement should provide better visibility and enhanced heat retention during the winter months. As part of our increased emphasis on conservation at the resort we also sealed off the old heating vents between the atrium space and the old mechanical room in the second floor of the tower. This insulation improvement will reduce heat leakage into the unused mechanical room and keep propane consumption down throughout the year. Cleanup efforts also included removing several tons of scrap metal from the old mechanical room freeing up over a thousand square feet of space for future utilization in the amenity building. Imagine a thousand plus square foot room looking down on the pool area from three stories up. The future holds many surprises for continuing improvements at Steele Hill Resorts. Published on December 19, 2011 in Resort Renovations. 0 Comments Tags: boilers, conservation, resort renovations. This year Steele Hill has taken a major step toward energy conservation. 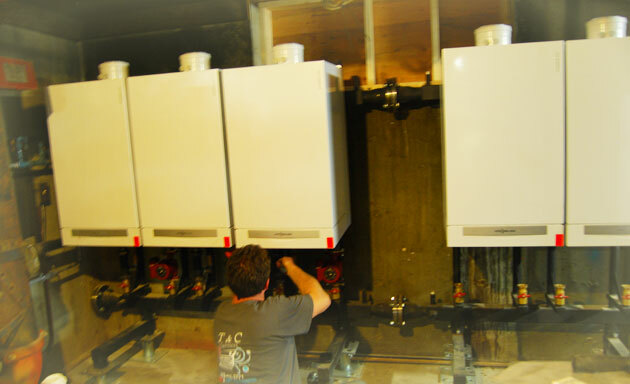 We are proud to share that we have installed all new energy efficient boilers in the main buildings at the resort. Given the major heating requirements of a large mountaintop resort like Steele Hill, increased energy efficiency goes a long way toward reducing fossil fuel consumption, providing better heating services and saving money. For the conservationist out there, here are a few facts to highlight our improvements. For the recent boiler installation in the amenities building, we installed a modular Viessman Vitoden 200 High Efficiency Boiler (see picture above). This modular unit runs in a range of 92 – 98% heat transfer efficiency, meaning that for every unit of energy created by burning propane our new boilers can transfer about 92% of that heat into the water running through the unit. The new boiler system is a smart unit. Based on the heat requirement in the building, the system will turn on or turn off the modular units that generate heat. This means that if the building is already warm, only one of the components will stay running. Our boiler consultant, T & C Services, estimates that our conservation efforts will reduce our energy requirements for the year by up to 20%. Now for the average Joe, that may not sound exciting. For the staff up at the Hill that get to experience mind blowing sunrises and pristine forests on a daily basis, we are pretty happy about using less fossil fuels.